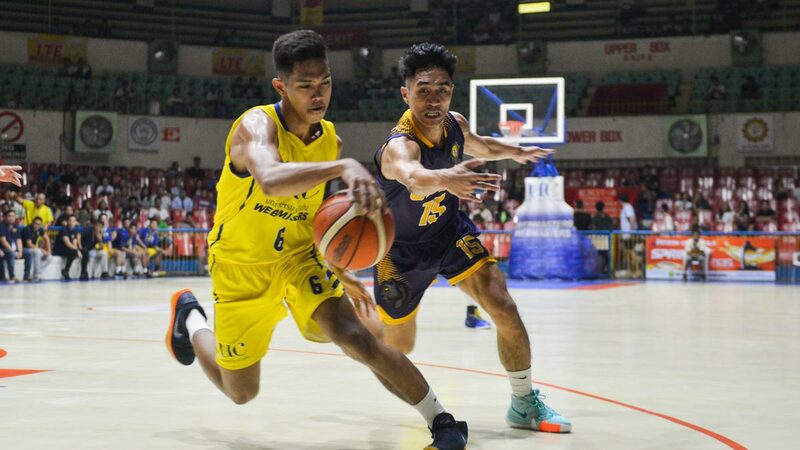 CEBU CITY – University of Cebu turned to its defense to turn back University of Southern Philippines Foundation, 55-45, and complete a sweep of the first round of eliminations in the 2018 Cesafi men’s basketball tournament on Tuesday night at the Cebu Coliseum. The Webmasters struggled to find the mark all game long, ending with a cold 32 percent clip. But they held their ground on defense to put away their sixth win of the season and deal USPF its fourth loss in six games. UC held the Panthers scoreless for more than six minutes in the last canto while Darrell Shane Menina, Paul Galinato, Justine Dacalos and Frederick Elombe conbned in a 24-2 run bridging the third and fourth periods to turn a nine-point deficit into a 51-38 lead. USPF pulled to within eight, 43-51, but the pesky Dacalos stole the ball away from the Panthers twice while Galinato and Elombe sank baskets late to seal the win for the Webmasters. Menina, the former Mapua and National University guard, scored 17 points, grabbed four rebounds, dished out five assists and had five steals to lead the way for UC. Elombe added 16 points and 15 rebounds. USPF, which shot just 30% from the field, was led by the 12 points and 11 rebounds of forward RR Cauba. The team’s leading scorer, Nigerian Rich Managor, shot just 4-of-12 and scored eight. He did however, pull down 11 rebounds, had four steals and three blocks.